China’s policy-makers certainly won’t be amused to learn that the average concentration of PM2.5 increased by 5.2 percent in the year’s first two months, especially in the context of the ambition to see the country achieve pollution-free status by 2020. This lofty goal was re-affirmed during the recent session of the 13th Chinese People’s Political Consultative Conference and National People’s Congress, where Ecology and Environment Minister Li Ganjie insisted that high-quality economic growth cannot coexist with a desiccated environment. In the wake of the “Two Sessions”, Chinese officials have been quick to release good news about China’s progress toward bluer skies, with Li emphasizing air quality improvements in Beijing and across other parts of the country. His ministry reported a drop in the average level of PM2.5 particles in 338 cities by more than 9 percent in 2018 compared to the year before. Coupled with a joint report released in early March by the UN Environment Program and the Beijing Municipal Ecology and Environment Bureau (BEE) calling Beijing’s war on pollution a “model for other cities”, China’s trajectory to environmental health seems exponential. There’s no doubt that the government’s fight for bluer skies is laudable. But the fight faces a long road ahead and praising it as a model for emulation is all but premature given the current circumstances. At a country-wide PM2.5 standard of 35 micrograms, any fall in particle concentration anywhere in the country is good news, though it’s still far above the 10 microgram maximum set by the World Health Organization. That’s because, in reality, there’s a flip-side to the positive headlines, namely that pollution improvements are still limited to certain regions and seemingly brief moments in time. 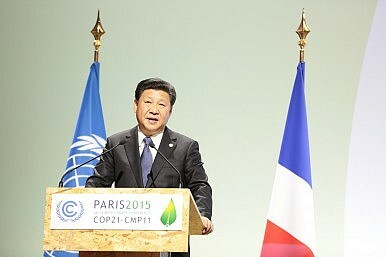 Even Beijing Municipal Bureau of Ecology and Environment Deputy Head Yu Jianhua had to concede that “heavy pollution episodes still occur during autumn and winter.” In the country’s Northern provinces pollution levels surged in January and February, rising 16 percent year-on-year in 39 major cities amid surging industrial activity and freezing temperatures. The worst offender was the coal city of Linfen in Shanxi province, which endured PM2.5 levels of 174 micrograms, a 23 percent increase compared to 2018 levels. In Shijiazhuang, the capital of Hebei province and China’s largest steelmaking region, emissions rose a whopping 30 percent to 144 micrograms. This reveals that China still isn’t doing enough to fight air pollution in a comprehensive and effective manner. As a matter of fact, the country seems to be backsliding on its earlier efforts, as shown by the move to revise pollution targets for the October-March period to 3 percent, down from the 5 percent reduction asserted in earlier plans. The reason behind this is simple: heavy industries like steel and aluminium that run almost exclusively on coal energy have been allowed to continue running during the winter as the government backtracked on blanket overcapacity cuts. These were originally designed to reduce polluting excess production, specifically in the Beijing-Tianjin-Hebei belt. The aluminium capacity cuts were instated at the height of China’s smog crisis in 2017 as an oblique way of reducing coal power generation, but due to trade tensions with the United States, Beijing felt compelled to keep production high. And as China struggles to balance economic growth and environmental imperatives amid a national and global slump, the government is unlikely to divert from this policy. Entering the sixth year of the “war on pollution”, Chinese industrial stimuli that only increase the global aluminium and steel glut coming out of China are too often prioritized over efforts to cut industrial pollution. Indeed, according to customs data, China’s aluminium exports in 2018 surged by almost 21 percent to a new record compared to the previous year. The impact on pollution levels of this policy shift isn’t making it easier for Beijing to achieve the self-imposed environmental goals. Still, this hasn’t stopped international commentators from picking up the narrative that China’s air quality improvements make it a model worthy to be copied across the world. While it’s true that the Middle Kingdom has been the pollution bogeyman for years and that progress is being made, the current approach remains woefully incomplete and flawed as long as the country’s main polluters continue to operate unabatedly. It’s therefore questionable if cities and regions on other continents would be well-advised to a adhere to a stylized interpretation of the China model, or to even adopt it. Systematic and more intensive measures are required if China hopes to make itself “pollution free” in less than a year’s time. As it stands now, many of China’s cities remain among the world’s most polluted, and unless Beijing finds a way to hit the brakes on carbon-intensive growth, nothing much will change. Grace Guo is a Vienna-based researcher and a program associate for an NGO focused on Asian politics. China Must Join the War on Illegal FishingHow China Can Help Save Papua New Guinea’s ForestsGetting Energy Right in US China PolicyChina Cleans up Its Act on Environmental EnforcementCan China Look to Carbon Capture for its Climate Pledges?